People who Help us – one of our fave themes! It featured lots of understanding and learning about the people who have jobs all around us and how they help us when we become ill, need some help or even just keep our area tidy. So first up is an overview theme plan. This just gives us an idea of what we will most likely be covering over the weeks. Week 1: Those who help us feel better! We started the theme by setting up a role-play area which we found the children had really engaged with in the last theme on Houses and Homes where we set up a builders site. So this time, we set up a Doctor’s surgery! It was much loved by all the kids. We pooled together all things related including rubber gloves, plasters, bandages, first aid kits, dressing up clothes, face masks, medicine boxes (minus the medicine of course) and so much more. It also proved to be a fantastic encouragement towards writing as I saw on many occasions, children were jotting down the prescriptions, the appointment times – it was mark-making at its best! We began the week by looking at those who help us feel better: Doctors, Nursers, Dentists and Vets. With our role-play area in full swing, we began by looking further in to the role of the Doctor. We started with our cutting and sticking skills to make our own Doctor’s bags. We also talked a lot about X-RAYS and then made our own by doing the fab activity below. All you need is black card, some flour to sprinkle over their hand for the hand template, cotton ear buds – in white! Such a simple activity but a great way of getting children understanding bones and x-rays. 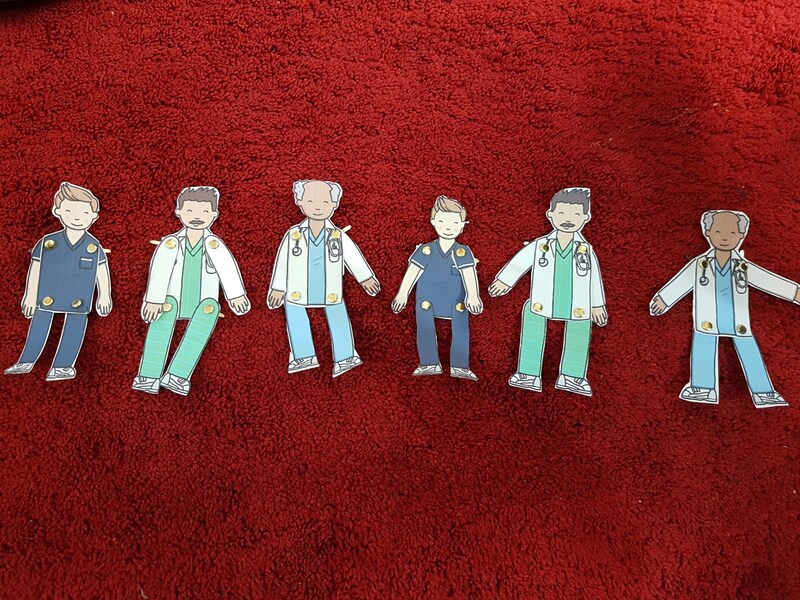 We made movable doctor, nurse and vet characters! Template available from twinkl. We had a guest visitor this week as we were also thinking about Vets! – Lulu the cat! This week in Literacy, our 4-5 yr olds learnt the sound /th/ and attempted to write their first sentence! What an achievement for them! So yes by Phase 3 sounds, you should start caption writing or short sentence writing. I’d actually start with captions first. Teaching finger spacing is very repititive and it does come slowly – not super worried about it at this stage. Our 3-4 yr olds were matching pictures to their initial sounds! In numeracy we began with time. Our 4-5 yr old children enjoyed playing the game – “What’s the time Mr Wolf”, following by making their own clocks and learning how to say the o’clock times! Until this day Ammarah recognises the time when it reaches the o’clock and actually reads the time in our living – but then she has always been fascinated by time! Our younger group – 3-4 yr olds learnt about night an day. We spoke a lot about the day time and then night time and what we may see outside in the sky. It was a lovely way to introduce the concept of time. We made this flap book below showing night and day. In Islamic Studies this week, we looked into the story of Prophet Isa (Jesus) and how Allah had given him the powers to heal others – similarly doctors heal us now too through the medicine they give us. It was lovely discussing the important job of making someone feel better by helping them get better when they are ill. Alhamdulillah good lessons learnt. We had a lovely review over the surahs the children memorised and celebrated with these brownies, and certificates – mashaAllah amazing Quran achievements by our little learners. If you haven’t started Quran memorisation with your kids yet, now is the time -they pick up so fast mashaAllah! Fantastic letter connectors – Ammarah was proud to show me she can put together the correct letters to make her name! Whilst these were purchased in Egypt by my friend, You can also purchase letter connectors similar to this. Week 2: Those who help keep us safe! This week we looked more at People who help us but in particular those that keep us safe. We focused in on firefighters and the police! We looked at their unform, their vehicles and what their jobs involved. We did a lot of our learning through visuals and videos, discussing what we found out. We finished the activity with this awesome craft! All you need to do is hand print your hand, each finger represents a firefighter trying so hard to put out a fire in a building. We added a piece of string to represent the hose, and little coloured hat cutouts too. We also read this lovely book – Burgular Bill by Janet and Allan Ahlberg (I’m sure many of my readers will remember from their childhood!) – which the children really enjoyed – maybe because he realised stealing wasn’t a nice thing. We talked a lot of the police and what they do to help us. We talked about Allah creating each of us so unique that even our finger prints were never the same as anyone elses. So if we ever tried to do something bad, we should remember that Allah is watching and that we can get caught because our fingerprints are unique to us and they can be left on anything we touch! Our 4-5 year olds were looking at the /ng/ sound this week. This is an example of how I teach them. I usually start by introducing the sound and check how they say it. Sometimes we include a jolly phonics song too. I then draw a picture, in this case a ring, see if they recognise my lovely drawings, then we sound out the word by drawing the sound buttons first. At this point it is good to explain that /ng/ is made up of 2 letters but its actually 1 sound. So before I write out the final word, I allow the children to sound it out themselves and attempt to write the word. We then check how well we did, it also gives me a chance to see how well the children are picking up the previous sounds. Our younger learners (3-4 yr olds) have moved onto the sound /h/ and /u/. They used some hay to decorate the letter h, and practised putting together some sounds to attempt some first reading! We started our first of money learning this week. Living in Saudi Arabia meant we had to also look at the currency here. So we began by introducing currency, comparing Riyals and Pennies and Pounds. In the end we played shopkeepers, buying an selling plastic fruit with the budget limit they were given. It was fantastic to watch them enjoy and play independently in the role play market area later. Our younger learners have moved onto the letter daal – decorating it to make daal – deek (hen). Hibah was super proud of her craft! We made these flashcards last year for our then 3-4 yr olds to get them excited about memorising Quran. So this year we used them again with out new 3-4 yr olds! You can go to our Free Resources page to here find the resource I made below . Week 3: Those who help us in our everyday lives! In our final week of our theme ‘People who Help Us’ we looked at the other jobs in our community that help make our community a lovely place to be in. : cleaners, shop keepers, post men and women, and builders. We dedicated a whole day to cleaners, and what better way to do it than to actually get cleaning! We showed children the different things used by cleaners and let them try it out themselves. It saved us all a lot of time cleaning at the end and it was a joy to see such a sparkling clean room! We took a break from our usual sound a week to focus a little on cvc words and rhyme! It’s lovely to see the children flourish in reading where they enjoy some books because of the rhyme. So it felt a right time to pause and have a closer look. These flashcards below (purchased at WHSmith) feature the familiar Biff and Chip characters. To consolidate what they learnt we finished the week with a recognising rhyme sheet! It was great to see how many of them were able to actually understand rhyme so quickly – alhamdulillah! Our younger learners learnt the sound /b/ and recapped over all the sounds they learnt so far – this process is really important to check what your child has retained after a few weeks and what needs a little recap. Remember children and even adults need s little review once in a while, so do not panic if your child doesn’t remember the previous sounds at all! It takes a few different teaching strategies at different times of the year to really help consolidate the learning. We introduced the children to the concepts of heavy and light this week in maths. We started by showing the children how to be human weighing scales. All you need it 2 bags, some oranges and some feathers. We then move on to weighing scales to measure different things around our room to see which object was heavier and which object was lighter. In Islamic Studies we looked at the story of Prophet Nuh (Noah) and his job given to him by Allah – to build the boat /arc. We talked about the difficulty in building a real boat and how big it must have been. We then followed on from the story to make this cute paper boats. We decorated them futher with coloured lollie sticks and flags. Our 4-5 year olds have started forming some of the vocabulary they already know from last year’s Arabic sessions. I love the way in which our Arabic teacher teaches her sessions! So that’s pretty much our whole theme on ‘People Who Help Us’ – all covered in 3 weeks, weaving in our Islamic Studies, Quran and Arabic for our Muslim Homeschool and nursery here in Saudi Arabia! Will you be following this theme with your little ones anytime soon?